The Vistabella Greener's won the Hurricane league in great style. San Miguel Christians played San Luis Wellingtons at home last week taking 5 points to 9. Well done to Pat McEwan, Bob Graham, Gary Raby 21-12: Bob Nesbitt, Brenda Rees, Mike Douglas 25-15; Ken Hope, Brian Allen, Reg Cooper 17 across. Shots for San Miguel 100, against 122. In the VCL, the Deputies were away to Emerald Isle, with only two wins. Ladies Singles, Anita Brown and in the Pairs, Pat McEwan and Ann Eagle. This week the Christians were at home to Quesada Blenheims only managing 4 points. Well played by Peter Rees, Jim Jarvie, Noel Davis 21-17; Paul Hayward, Tom Dalgleish, Brian Allen 29-18. Other games were all very close. Shots were close 106 to San Miguel – 108 to Quesada. The Moors were away to San Luis Wellingtons only picking up 1 point. William Holtham, Bill Knight, Fred Willshire drew 14 all. Shots 76 to San Miguel and 116 to San Luis. Club mornings still on, Sundays, Tuesdays and Thursdays 0945 for 1015. 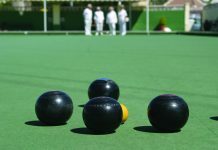 WASPS on Wednesdays 1.30pm, numbers are falling due to the heat, a friendly afternoons bowling for only €5, including use of woods, shoes and free tuition if required. The Vistabella Greener’s won the Hurricane league in great style. Congratulations to all the members of the Greener’s team for their outstanding performance this season, there final game was away to the Emerald Isle Vulcans and despite knowing last week that they had won the league they still kept the pressure on and went out to finish on a high! Sheila Cox, Sheila Whitehall & Les Barber 32-15. Ron Smith, Sue Jenkins & Dave Jenkins 23-14. Jenny Chaplin/Del Gunning, Ken Savage & Peter Whitehall 17-13. Mike Irwin, Sue Norris & Pat Rafferty 17-12. Frank Barclay, Peter Cadwell & Barry Norris 16-16. Shots, VB 120(11) – 87(3) EI. 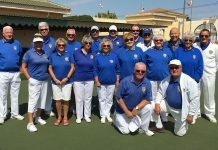 Spitfire division Fairways still with a few games to play gained some important points from their home game against La Siesta Wasps, Tony French, Stuart Allman & Bill Pain 38-7. Lin Watkins, Mike Regan & Eric Bishop 30-11. Olwyn Ratcliffe, Geoff Paylor & Ken Cuthbert 24-8. Lynne Bishop, Jenny Bowman & Ian Kenyon 16-10. Sandra Burrows, StJohn Broadhurst & Brian Dunn 21-16. Beryl Regan, Dane Howard & Maggie Furness 16-16. Shots, VB 145(13) – 68(1) LS. VCL. 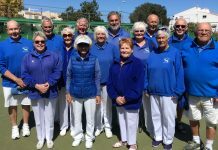 The Vikings were away to La Marina only picking up four points…quite disappointing, but well done to the Ladies Singles Lynne Bishop for a 21-10 win and the Rinks team of Pauline Rafferty, Andy Leggatt, Pat Rafferty & Eric Bishop winning 19-12. Shots, VB 88(4) – 98(10) LM. The Saxons also had an off day, playing the Quesada Lions at home they scraped through with just one win from Mens Singles Ian Kenyon of 21-13. Shots, VB 89(2) – 120(12) Q. Despite the heat we need to keep going so please everyone put your names down…you will soon be able to have a well earned rest. Adiós. Sponsored by Venture fleet, Rivingtons Restaurant, One-way services & TV Choice. 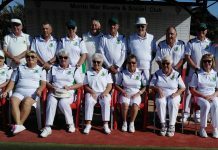 SAN LUIS BOWLS CLUB REPORT 23.06.17. 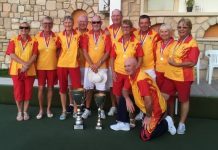 Wednesday 21st June VCLeague SL Falcons were away v San Miguel Sherriffs; a close match right to the very end (which could have gone the other way), but even with Jules killing the last end so we could replay it, we couldn’t quite close the shot gap; 94-99, points 5-9. Winners: pairs; June & Keith Jones 21-10, triples; Margaret & Neil Morrison, Derrick Cooper 16-16, rinks; Shirley Verity, Sheila Cammack, Barry Edwards, Jules Pering 22-12. Friday 23rd, Spitfire Division: SL Wellingtons were home to San Miguel Moors, and had an excellent result: shots 116-76, points 13-1. Winners: Carol Lowry, Les Bedford, Ray Pollock 17-14, Kath Reid, Ann Holland, Roy Cordell 27-7, Margaret & Neil Morrison, Derrick Cooper 18-16, Colin Jackson, Bill Webb, Mal Hughes 19-13, Bob White, Vic Slater, Keith Lowry 21-12, Judy Carroll, Jan & Brian Pocock 14-14. 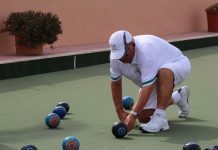 Whereas some clubs may be considering reducing their entries for the coming winter season, San Luis Bowls Club is going back to 4 for the South Alicante league on a Monday and 4 for the Southern league on a Friday. Being a competitive club does not mean that there is not room for everyone in ALL divisions to get at least one game a week. We will have 1 in Div A, 1 in Div B and 2 in Div C and it is as much the latter where we welcome players – either those who have played in the leagues and want to continue, or those who are now ready to test the water and get involved and above all enjoy the game. Your commitment to joining San Luis BC would be needed BY 1st August with membership commencing 1st September. However by joining in July there would be no charge for August when bowling at San Luis. For further information please contact the Club Captain – June Jones 966 188 920 or 691 903 773. The third match of the Ladies 4 wood pairs took place against Quesada and our ladies carried on the good work from last week and came away with a 5-0 win. Ann-Marie Stevenson & Pat Harman playing at home won 22-19 whilst Sue Mahomet and Sue Jordan were away and came away with a 15-13 win. With just two matches to go in this competition La Siesta are in a good position. Go Girls!!! Keep up the good work. 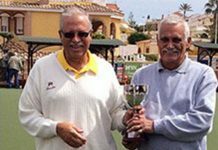 In the VCL League away against Vistabella Saxons the team only managed one win with Alan Barton beating Ian Kenyon in a nailbiting match winning by a single shot 21-20. 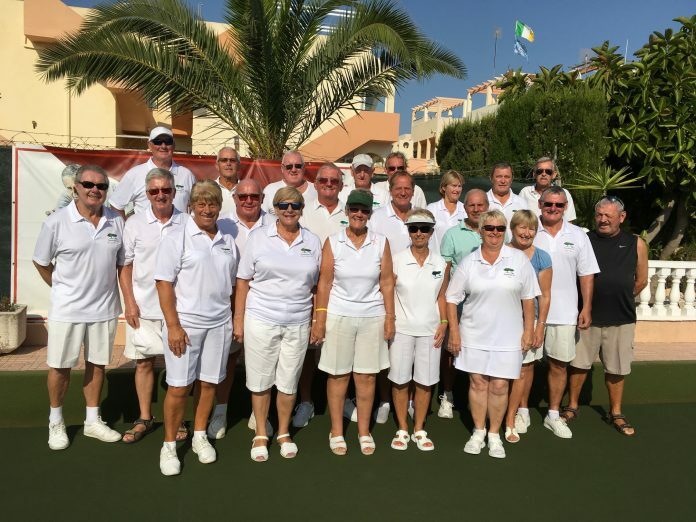 Unfortunately this was our only win on the day but congratulation to our rinks team of Irene Laverick,Jean Hepehi,Dave Laverick and Jonnie Ball who managed 5 shots on the final end to cut the deficit in their match to 19-13.The overall result was a win for Vistabella by 106 shots to 73. In the SABA League the Hornets were away to local rivals San Luis Hercules and the usual close contest took place. After 9 ends San Luis lead on 4 of the 6 rinks but a battling performance by the Hornets took the match down to the wire. Matches on 3 rinks being settled on the final end. For the Hornets the win by Ron Sheldon, Sid Gallup and John Ball being the most exciting and improbable as they were 5 shots behind with 3 ends remaining. Sid Gallup played excellent running bowls and skip John Ball held firm to turn a one shot deficit on the penultimate end to a win by 19-18 at the death. Liz Comstock, John and Dawn Taylor managed a 16-11 win but they only held a 1 shot lead after 17 ends. The star on the final end was Liz who bowled three exceptional lead deliveries to take the pressure off. 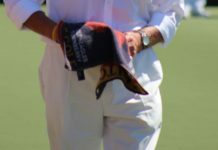 The Hornets did not have it all their own way on the other close match where Robin Harker for San Luis bowled a great wood to beat the Hornets Triple by a single shot. 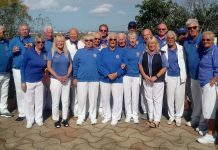 Other good results on the day for The Hornets was the trio of Penny and John Porter with John Lincoln winning by 19 shots to 13 and Jean James, Irene Laverick and John Clarke who won 24-15. The overall match result was a 10-4 win for La siesta by 109 shots to 92. 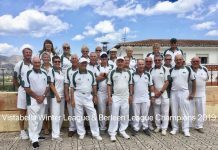 The Wasps were at home to Vistabella Greeners the best rink for the Wasps was the trio of Sue Mahomet, Jim Hudson (thank you for standing in at the last minute) and Brian Fraser​(first league bowls game for 2 years, welcome back) 22 – 10. Sheila Chorley,Vic Mahomet and Brian Harman won18-13 and our drawing rink Joy Gardiner,Irene Mangan and Sue Jordan 16-16. It was nip and tuck on 2 rinks , but overall a good performance. Shots for 110 against 106 points with the points shared 7 apiece. The hat trick was on and we did it by beating another of the top three sides, this time it was at home against Vistabella Vikings. More the pleasing as we are still at the bottom of the league. The score was 10-4. The Parsons couldn’t keep up their romance and only Peter managed a win but it was 21-7. Dave Hadaway and Tom Spencer had a good win 19-9 after playing 21 ends. Barry Sadler, David Taylor, Roger Stacey and Dave O’Sullivan won a tight game by 18-16. The most exciting ending was left for Captain Colin Armitage, Carol Smith and Lynne Armitage. Going into the last end one down, they picked up three to win by two. So it is left in our own hands to see if we can come last but one in the final game. Seats are going quickly so please book yours now !!! Last game for the Pilots at home to Quesada Lancasters who unfortunately, from our point of view, bombed us out of sight. We lost 10-4 leaving us, I think, in third place. A good enough season though so well bowled to everyone especially our two winning rinks this week. Those of Mike Smith, Peter Bailey and Gina Hindle and Dave Hadaway, Arthur Cronk and Dave O’Sullivan who won 26-7. If you want a free pint ask Dave how his better half got on. 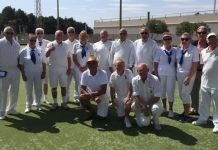 There was no VCL match this week as it was a bye, in the Levante Lawn Bowls Men’s pairs competition Dave Webb and Phil Lockley won a hard fought game against Derek Jiggins and John Rimmer at Country bowls. It all came down to the 18th end with Greenlands leading by 19 shots to 17, country bowls were in contention holding one with a measure for two, the measure favoured Greenlands ! just. Final score 19 shots to Greenlands 18 shots against, so they will now proceed to the the semi-finals on the 8th September, In the South Alicante Hurricane Division, Gladiators were at home to Monte Mar Torreadors. Final scores were – Total shots for – 104. Against – 95. Points for – 8. Against – 6. Winning Rinks were — Jean Thompson, Jean Giddings, skip Dave Webb. – 33 shots to 6. Sheila Stead, Mary Lockley, skip Jim Oliver. – 26 shots to 15. Vic Young, Dave Giddings, skip Dave Thompson. – 20 shots to 10. A very pleasant game was enjoyed by all and nice to finish our last match with a well deserved win. If you are considering leaving your present club at the end of this season then why not come to Greenlands Bowls Club. You can be assured of a warm welcome by our friendly team members, and play on one of the best surfaces around, so why not find out more by ringing Haley on 966844399.